Last month I was in Nairobi for the launch of the documentary ‘Heal the Nation’. This 30 minute film was created by Picha Mtaani (Swahili for ‘street exhibition’) a UN-funded initiative that focuses on reconciliation through ‘photographic exhibitions and debate’ set up by 27-year-old photojournalist Boniface Mwangi. As violence broke out after Kenya’s 2007 election, Mwangi quit his job as a journalist and risked his life to travel around Kenya documenting what was taking place. Mwangi’s photos were published in edition 5 of the literary journal Kwani, which attempts to ‘provide a collective narrative on what we were before, and what we became, during the epochal first 100 days of 2008’. My research on contemporary Kenya writing is currently focusing on Kwani 5 and I am particularly interested in the ways in which the texts published in this journal emerged out of the literary network and google group ‘Concerned Kenyan Writers’, as well as the way in which these texts have continued to circulate in different public spaces. Mwangi’s photographs were also published in the book Kenya Burning, a co-publication between Kwani and the Go Down Arts Centre (who curated an exhibition of the same name in April 2008). Picha Mtaani have exhibited photographs from Kenya Burning across Kenya and these images have been seen by over 500,000 people. The documentary is based on footage of this travelling exhibition; it shows both emotional reactions to the photographs themselves, and shares the narratives of victims and perpetrators prompted by their encounter with the exhibition. Picha Mtanni are hoping to reach 3 million more people with these images and stories through the circulation of the documentary. The free launch event took on City Hall Way in the city centre of Nairobi outside Nairobi City Council, overlooking Nairobi Law Courts and the Kenyatta Conference Centre. 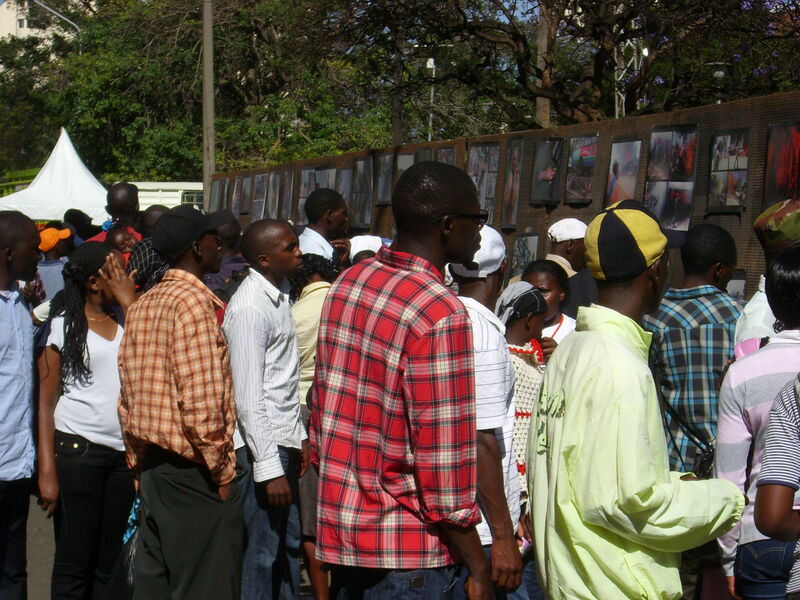 From 10am Picha Mtaani’s exhibition of photos documenting the post-election violence was on display, and by positioning this in a public pedestrian area it drew in a constant stream of people. From 10am to the screening of the documentary at 7pm people crowded around the images and it was often impossible to get close to them. One of the reasons I travelled from Kigali to be at this event was that across the day, building up to the screening of the documentary, was a programme of poetry and theatre which focused on sharing literary responses to the post-election violence. The poetry performances were curated by Njeri Wangari, also known as Kenyan Poet, and featured Teardrops, Ban 2 Slim, Harry the Poet, Akil (El Poet) Wario Hellen, Ndanu and Njeri Wangari herself. Wangari commented that poetry is often associated with expressing love and joy but that here it was being used for ‘reconciliation and speaking out’ and another compere commented ‘‘we are not only here to be entertained but to make a lasting impression.’ Over the afternoon as poetry in English and Kiswahili was shared with a small audience and drew in a passing crowd, audience members were encouraged to partipate not only in refrains (for example Wario Hellen’s ‘Kenya is for you and I’) but also in discussion and debate about Kenya’s past, present and future. 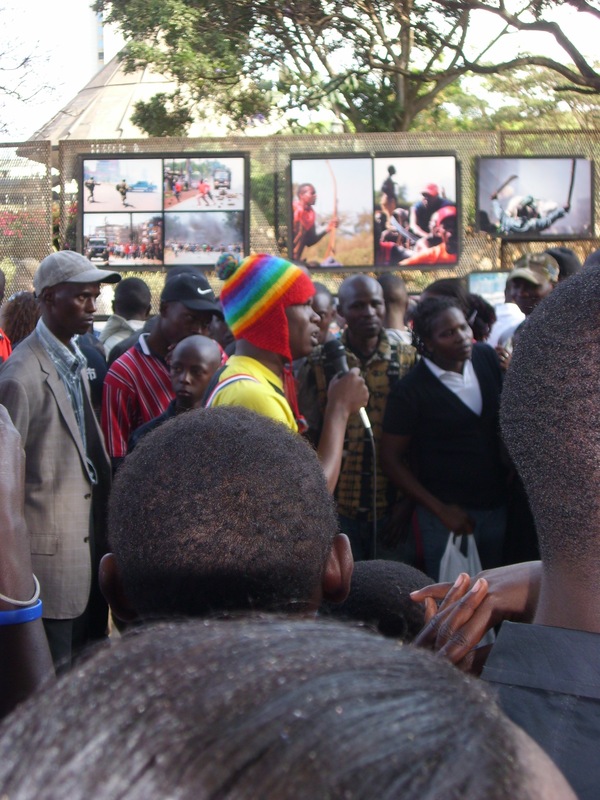 Break-time productions then performed a powerful theatre piece in Kiswahili directly in front of the photo exhibit. This was one of the first times that the attention of passers-by turned almost entirely away from the photographs and towards the performances. As the sun set 1,133 candles were lit by members of the audience and placed in brown paper bags before the photo exhibit, as a striking visual act of memory for those that died in the violence. Directly before the screening of the documentary speeches were made by donors who funded the making and production of the Heal the Nation, including USAID, the Swiss Embassy in Kenya and UNDP. Swiss Ambassador Jacques Pitteloud, who was ambassador in Rwanda during the genocide, gave a speech sharing his experiences and drawing parallels between the events in Rwanda and the post-election violence. He emphasised the importance of remembering out of respect for the past, but also for the present and future. He highlighted that in Rwanda that there had been a history of smaller massacres and violence from the 1960s onwards, hinting that there could be worse to come for Kenya if issues of healing and reconciliation aren’t addressed before the elections in 2012. Yet he conspicuously failed to highlight that for Kenya too the post-election violence was not a one off, something that Picha Mtaani’s chair responded to and emphasised in his speech that followed. Given my focus on the relationship between writing, publishing and memory, it was great to be able to witness first-hand literary and artistic responses to the post-election violence evolving into different media and spaces in a dialogic way (social media guru Philip Ogola who was onsite to spread the word online told me he reached over 800,000 people with tweets about the event). For me it was also significant that while the focus of the event was very much on memory and remembrance, this was placed in the context of the more specific and urgent aim of healing and reconciliation in advance of the 2012 elections. The more I work on literary responses to the post-election violence in Kenya, the more I see that the work writers and artists are doing in relation to memory is quite different from texts that take on ideas of history and memory in a less immediate context. Having recently seen Yusef Komunyakaa in dialogue with the Kenyan poet Sitawa Namwalie, it was striking that while for both poets ideas of history and memory are central, it took Komunyakaa 40 years to be able to write about his experiences in Vietnam. How do time, distance, silence, urgency, the project of reconciliation, change what I’m asking about these texts in relation to their intervention in cultural memory? Kwani 5 was funded by the Ford Foundation, and I want to do some work on the role of external funding and donors in relation to the literary and publishing space, and particularly in relation to memory. How does the gate-keeping role of funders shape the space of cultural memory? What is the difference between art playing a role in reconciliation and art playing a role in cultural memory? The prominent space given at the launch event to the voices of donors has given these questions a stronger emphasis. Finally, again and again in conversations I’m having about history and memory in relation Kenyan writing, the subject of Rwanda returns. 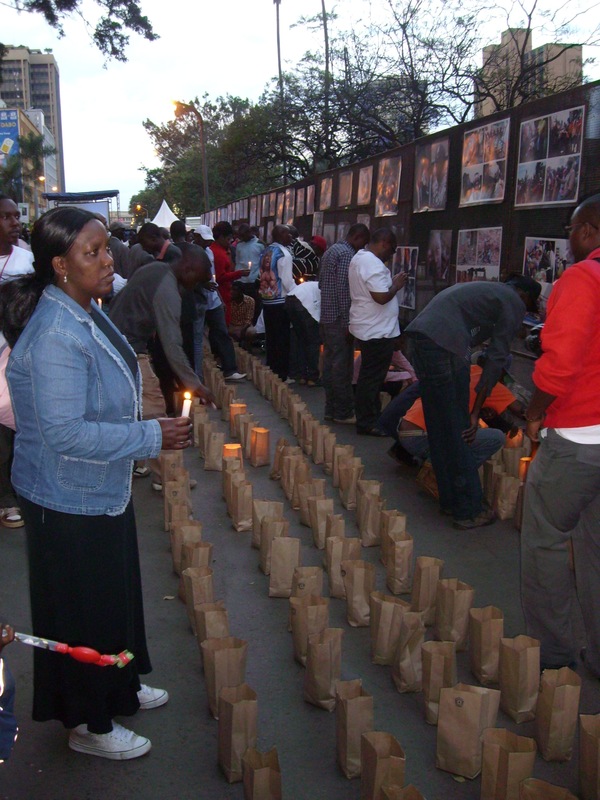 Seeing a connection between the post-election violence in Kenya and the Rwandan genocide being made again here has prompted me to think more seriously about the ways in which I might want to take on ideas around memory and East Africa in my research. The event finished with one of the victims of the post-election violence who shared his story during the documentary, addressing the audience and explaining why for him this project was so important. His words were a powerful comment on the role of storytelling and memory and so I want to end with them here. Having lost his brother in the violence and now working to support his brother’s family, he commented that without initiatives like this ‘we die with our stories’. Apologies for a rather epic first post! As you know one of my motivations for wanting us to have this blog was to have a space to to be able to write about and document events I attend or books I read that are ‘related’ to my research, but wouldn’t otherwise have a direct output. I’d really welcome any reflections you have after reading about the event – or any thoughts on some of the questions I ask! This event seems to had been fantastic! And I would love to see this documentary! I don’t know much about this topic. I have studied the tribunal of reconciliation during my masters, and read many analyses of this process; political and social implications, criticisms and suggestions. But what stroke me more was the final report (the one with thousands of pages). I remember being completely taken by the stories. Not the morbid curiosity of reading about episodes of violence and abuse, but reading the result of an ultimate effort to achieve reconciliation, with oneself, with the aggressor, with the other side. The idea that reconciliation starts in telling your story was new to me. This is the opposite of what I lived in Brazil. I grow up immediately after a military dictatorship in Brazil. Officialy the dictatorship was over. But in reality, my parents could cast their first direct votes for president 10 years later. Stories of violence and abuse were common, while in school every Monday we had to sing the national anthem with the right hand on our hearts. There are people in my family who was arrested and tortured for helping supposedly communist friends. My father was arrested for having long hair! Most of urban middle class has some horror story to tell about friends who disappeared or family who was arrested and tortured. But in Brazil we didn’t managed to go through a reconciliation process. In 1979, when I was born, it was declared the amnesty. People who committed a ‘political related’ crime between 1960 and 1979 were pardoned and not judicially processed. This means politicians, students, artists and all kind of activists that were opposed to the military government and were arrested and or expelled of the country. But it also means that all militaries and state agents who tortured, raped and killed so many people were also amnestied. So, the important part of the process of reconciliation, which is telling the story, was left at side. Of course, people told their stories in books, and many artists sang their experiences. Many movies were made, and had being tortured during the dictatorship was considered a favourable aspect during the political campaign of our current president. But a few militaries opened their mouth. Official documents are still sealed, many disappeared. Fear, shame, we don’t know exactly what keep an important part of this story out of the process of reconciliation. It is still a very open wound. Enough of Brazil, let’s go back to Africa, I have a friend (Dr. Mario Rufer) who wrote his PhD about the materiality of cultural memory, in special museums, in South Africa. He compared it to Argentina, where they were also stroke by a severe military dictatorship. It is obvious that my scope of this topic is very personal, and I am not answering none of your questions. What I am thinking is the role of texts in the construction of history and memory, and the effort to produce them, to believe that through those texts we could achieve reconciliation. Or through the pictures, or through the museums. in sum, through memory. Constructing memory is a way to seek reconciliation. But I think this is still very out of your research. A long post deserves a long comment – sorry about that! Nara – after this (and now I am down with the blog-tings), wanted to let you know I met someone in the States who found himself very suddenly in a US high school, having moved from Brazil, with no idea where his father was, not knowing that his father had been expelled for ‘intolerable political activities’ – he found out later as an adult. He, and the rest of the family, including his unbelievably gorgeous (I mean stupidly film-star glamour beauty serving me coffee in one of the student food-halls), warm, generous ‘mom’, have not seen him again and he is still, officially, on a missing persons list. He told me how cheated he feels not being able to tell his story, there not being a forum – formally organised, or not, through the media, official or not – for him, now diasporic, to talk about this absence and this loss, to talk about his difference in difference – how people in the States just didn’t get it. And all the time, he plays this Afro-funk Latin-jazz rap (honest and true – I just can’t describe it any other way). It was kind of disconcerting – the music, I mean. Which reminded me… Again, not wishing to draw any false links or conclusions, but one of the most interesting papers I heard at a presentation under the title ‘Africa in Theory’, talked about the role of sound in Brazil, arguing that music was one of the ‘texts’ that engaged a kind of cultural memory that was otherwise not able to be ‘visible’ or even available. The significant point is, though, that these memory-acts are not conscious but deeply innate, and hence their possibility and also the impossibility of their acknowledgement. It was a deeply personal paper. I didn’t draw conclusions and I don’t want to go any further at risk of misrepresenting it – but it just all reminded me how close these links are, how open for cross-responses. Oh, yes, the role of the music (and musicians) in healing the nation (if I can borrow Kate’s title) was and is very important. I agree that it opens a possibility for expressing, feeling and empathizing with all the victims of the dictatorship. But no, it is not enough. There are so many beautiful songs with lyrics that play with the words; harsh criticisms to the military government sounding to dumb ears as love songs “Despite of you, tomorrow will be another day, you will pay for the pain you caused me etc…). I think that an organised and open forum still need to be promoted. Unfortunately, I don’t see this happening any soon. Loving the long comment Nara! If you are interested, maybe I can come over to your house when I’m back for Christmas and we can watch the documentary together (every audience member got a free copy). Would love to talk to you more about ideas of reconciliation. Very interesting to hear about the work you did in your Masters on reconciliation – was this across different contexts or focused on one particular country? Also appreciated you sharing the personal experiences of you and your family in Brazil and what it was like to not go through a reconciliation process. Sounds very complex and difficult….I too think people being given space to share their own personal stories is really important to reconciliation. In my research am particularly interested in texts that prompt or give space for readers/individuals to engage and share their own stories in that way (so for example the website for ‘Half of a Yellow Sun’ where readers are prompted to share their own personal story about the Nigerian civil war). Would be great to continue this conversation in person, and thanks again for engaging with my epic post! Kate, when are you coming to the UK? I am off to Brazil very soon. But I will not stay there for long, so I will be back in London in January. It would be really nice to see the documentary! Anyway, my work on reconciliation was only final year essay. But I do find very interesting this subject, and I believe I could put you in contact with this friend of mine who studied SA and Argentina. Sorry for the slow reply….and I know I’m late with my next post too! It is coming… When are you off to Brazil? I’m in the UK from 17th December until 3rd or maybe 4th January…will I miss you? !